Our new Vexan® Inshore Rods lineup is designed to meet your exact needs for casting and perfect presentation of any inshore fishing lure. The Vexan® Inshore Rods feature a tremendous backbone for both cast and hook-set, yet retain the sensitivity needed to detect even the lightest bite. Vexan® rods are built with a modified IM8+ trade secret TitanTM technology blank offering superior strength, flexibility, sensitivity, and years of durability. Vexan® rods use trade secret, super light alloy guides with super strong 316ss alloy guide rings to give you years of quality fishing, providing smoother casts and causing less wear and tear on your fishing line. High quality Fuji® components are used on all Vexan® fishing rods. From the top quality Fuji reel seats to the revolutionary handle design, Vexan® offers superior quality for less money. International shipping is not available on this item at this time. 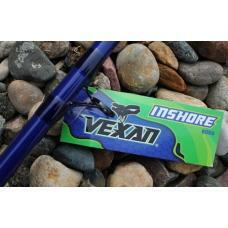 *** We are now able to have TACKLE INDUSTRIES and VEXAN rods shipped to Canada via FedEx. If you have other items on your order, additional shipping charges may apply, as shipments would occur from more than one location. Should you ONLY have rods from Tackle Industries and/or Vexan on your order and nothing else, there will be no additional shipping charges from what is shown during your checkout.